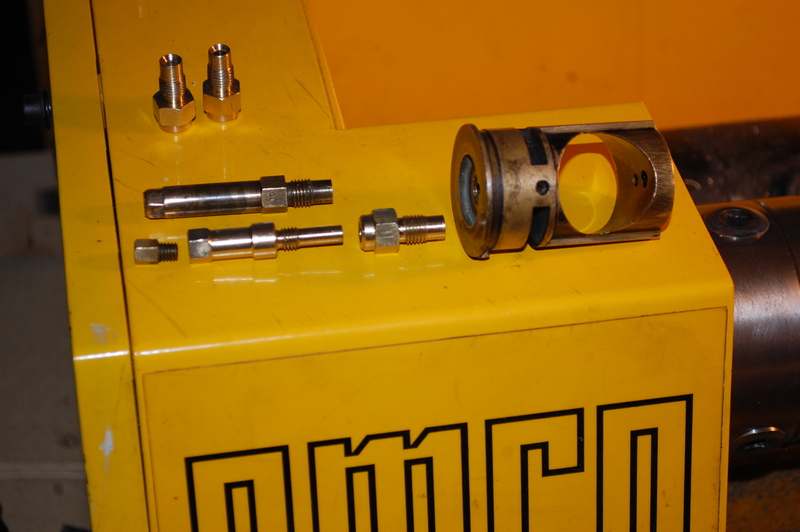 Having recently re-acquired my little Emco Compact 5 CNC lathe I found time over the Xmas holiday period to experiment with a little project that I’ve had in mind for a short while. I had noticed that the ’30 M90 was running rich at running-in speeds and sooting up the plug. 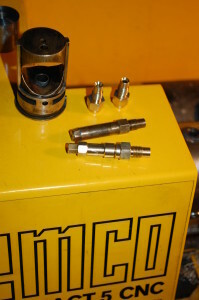 Not a major problem, but closer investigation revealed a home-made needle jet in the Amac 10MDY carb. Although, conveniently, this needle jet was made to accept the later small Amal main jets it was badly worn and the likely cause of rich running low-down. I asked around but was unable to locate any replacement needle jets or needles for that matter. 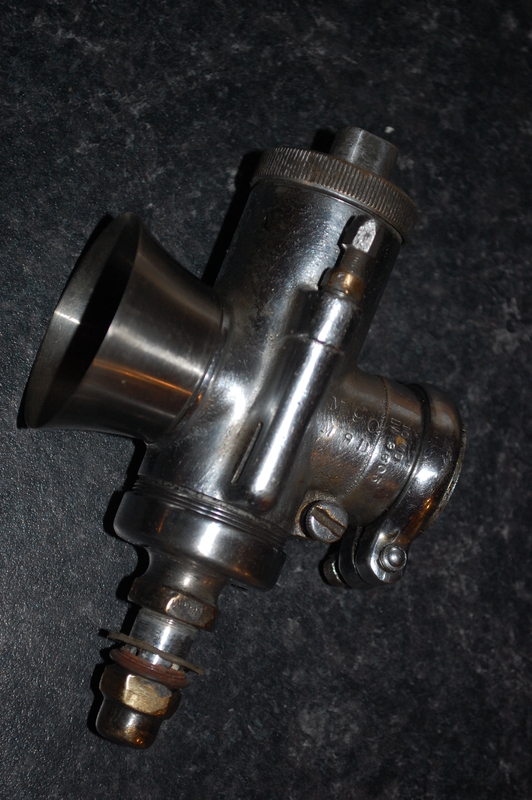 So, following a chat with the ever helpful (and patient) Martin Bratby I decided to look into producing an adapter that would allow 29 series needle jets and needles to be used with the earlier Amac carb. After a few false starts I came up with a design that could be produce on the little Emco. It was tight as there isn’t much wall-thickness to play with if everything is going to line up correctly but I was pleased with the result. 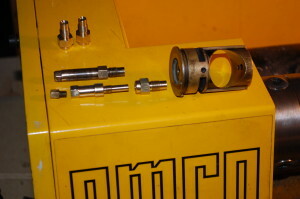 The photo above shows the Amac jet-block with an original needle/main jet assembly next to a 29 needle/main jet screwed into one of the new adapters. The next job is of course to try one on the bike to see how well it works. The plan is to start off with a 106 needle jet and the middle-clip of a 29 needle. I’ll probably adjust the position of the needle jet up/down in the adapter to fine-tune rather than move the needle clip itself as the “correct” relationship between slide-needle-needle jet is of course difficult to establish when mixing and matching the 29 and 10MDY elements. To help with this, I have use of a decidedly un-1930s Innovate LM-2 AFR data logger that uses a Bosch car-type Lambda sensor rammed up the exhaust pipe to monitor the exhaust gases. Once lashed up on the bike, it is relatively easy to record the air-fuel-ratio at different throttle openings, engine speed and load. This makes fine-tuning of carburation using the modern fuels a lot less hit-and-miss for someone with my lack of sensitivity in such matters. This entry was posted in Shop and tagged Model 9, Model 90, spares, Sunbeam by Dodson. Bookmark the permalink. I wonder how you got on curing the rich running at low speed / small throttle opening? I have a similar challenge with sooty plugs and rich running on my 350cc Blackburne engined Rex Acme with AMAC 15MDY. It’s most comfortable running at 40-50 mph. It would be great if I could get in touch to discuss. I think a lot of my problems were due to mismatched parts which is what happens over the years. I went back to basics and discovered the float height of the Amal twin floats was way too high which would certainly contribute to rich running at low throttle openings of the Amac 10MDY. Once that was sorted I then worked on the needle and needle jet to ensure that the carb was working on the parallel portion of the needle initially before moving on to the tapered section after perhaps a 3rd of the throttle opening. 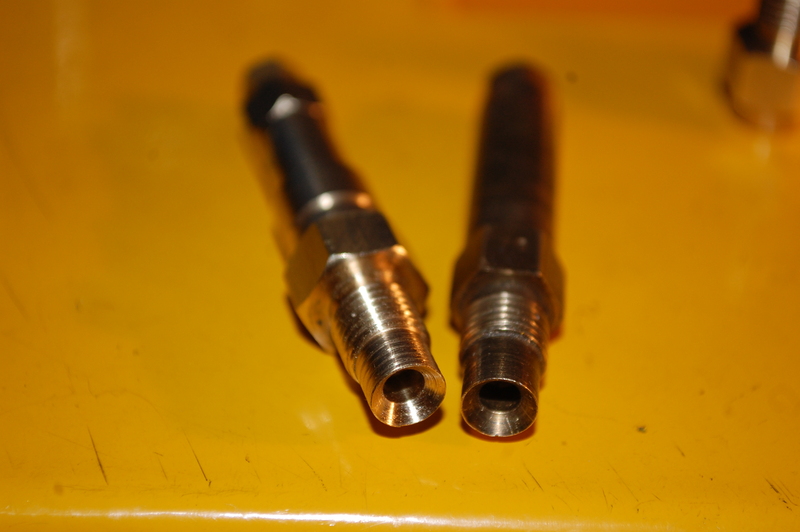 The “original” needle I had was just all taper and certainly not doing much to restrict fuel flow at small openings. So, I machined an adapter in orderto use Amal 29 main and needle jets and place them in the correct position. After measuring lots of needles a Triumph Bonnie D needle was cut to the required length with new grooves for the circlip. The Amal 29 jets are an appropriate size for my 500cc and a 29/001 is actually the correct carb for the bike if I could find one. I hear needle jets and needles wear oval which will also cause rich running. However, if your slide is loose in the body of the carb, air can find its way around and cause lean running so that’s another thing to check out. If I remember right a chap called b561 was selling new needle jets for the 15MDY on ebay although I have no experience of them. All in all I’m happy with the way it has worked out. The bike starts easily enough and goes well too. The “enrichening device” on the side of the carb doesn’t have much effect which suggests I might benefit from a leaner main jet but I haven’t pursued this. I hope this helps and will be interested to hear how you get on. Thank you for replying so quickly. I’m new to the art & science of needle jets, needles and the differences between the AMAC & AMAL but I’m learning fast! Yes, mismatched or adapted parts is I think at the route of my challenges. They good (or bad) news is I have 2 carbs me to compare and experiment with. One is a 15MDY reconditioned by b561 otherwise known as Joe Pletersky with an Amal 38 main jet and ‘standard’ float & wide grooved needle With removable clip. The history of the other is less well known but probably modified by Mike Sherwin a previous owner of the bike. It has a different, probably Amal float with clip brazed to the top and 2 extra notches up the needle to experiment / raise the float height and a 36 main jet. So I’m running through the permutations with what I’ve got. On standard float height it requires tickling and always a small lift of the slide via the twist grip. It doesn’t want to idle & the enriching screw has no effect. Your feedback is very helpful. More reading and experimenting to be done. Understanding which needles and jets are appropriate and checking for parallel & tapered sections sounds like a good first step after float height. I also like the idea of a wideband O2 sensor shoved up the exhaust pipe as I want to make sure I’m not running too lean at 50mph! Is there a way to exchange email addresses & contact details outside of this public forum? Perhaps the moderator could send you mine.